Hi friends! Welcome to my first post / series of 'Devotions by Dave'. I want to give you a little background of how all of this came about. There are a couple of reasons. First, as Dave and I dated long distance for a year, we journaled (a full post is coming on that soon). Dave and I didn't just write mushy gushy stuff but we would write what we learned in our devotions. I loved that because I could see what God was teaching him. Dave also preaches at his church on occasion when we go home to visit. I knew prepping for a sermon was work but seeing your husband work all day and then spend his evenings studying was eye opening to me how much work actually goes into sermons. 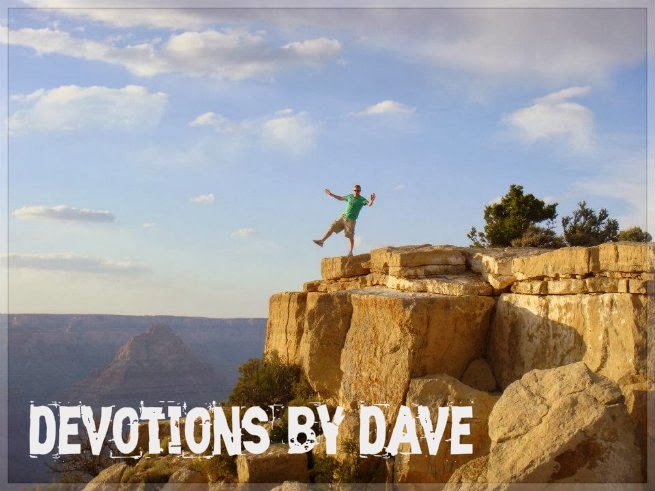 So, after reading journals and hearing Dave preach I thought it would be great to share some of what God has taught him on my blog. The first two posts come from one of his sermons that he preached on Joel. I didn't know this what he was going to give me to blog about but it couldn't have been better. The verses he talks about where verses that I clung to during a time in my life when I was very broken. It's neat to see how God works like that. Not the broken part (that was my own doing) but to see how he ties verses together with the stories of our lives. In all your life have you ever seen a day like today? This was the Prophet Joel’s question to Israel after facing one of the most devastating natural disasters in the countries history. A locust plague. Now most of us have never faced a locust plague but what about you? Have you ever faced a day in your personal life quite like today? Have you ever faced a challenge like the challenge you are facing today? Have you ever been through a difficulty like the problem in front of you now? Do you feel like your past and your mistakes have ruined your future? Joel 1:4 describes the problem with these locusts. Caterpillar – devour or consume – rasping teeth. Creeping - lingering effects of the swarm, after the shock and surprise of that overwhelming trouble has come and gone - some of it remains and creeps into your heart and mind and trouble you incessantly. Stripping - devouring brings total devastation - seems to take what little good is left. Not just ruins your today but seems to destroy any possibility in your future. Maybe you feel like one or all of those locust has got to you and you’ve missed out because of your sins and your mistakes. Maybe your past was dismal, maybe in your present the situation is messed up too. You can't get your time back, you can’t undo things or change some of the consequences you’re suffering, but you can get back many of the blessings you missed and God can give you a better future than you’ve ever imagined. A future that takes those past failures and those mistakes and redeems them to where you aren’t troubled by them or held back because of them but find joy in what Christ has given you now. God can use talents and your success, but He can also use your failures, mistakes, even your messed up past. He doesn’t endorse or embrace your sin but when you come around he is able to use it. Moses murdered an Egyptian, David committed adultery, Rahab was a harlot - God didn’t say 'you messed up so now you’re done'. Instead through those situations he used them. Whatever you’ve lost, for whatever reason - a friend, your job, finances, your time, your purity, your reputation – God can restore it. He has no limits and he can let you live a life without limits. Even better one day he will make all things new. And that will more than make up for the insignificant things that “the locust” cost you here on earth. I am so excited for these! Loved this! It is amazing how God can turn the mistakes of our lives, if we desire to do good and make good come out of them! God truly is a restoring God! How fun that your husband shared this with us on your blog!!! :-) Thank for linking up with the Faith and Fellowship blog hop! What a good devotion! Good job, Dave :) I like what he said about one day, when all things are made new, it will more than make up for anything we had to deal with on this earth. What a great mind-set to have! Yes, God is! I'm so glad I came across your link-up. I'm hoping to join in more and read and be encouraged from other godly women. Thanks! He did do good. I think Dave has that mind-set because of what he has been through. You can tell Dave that I'm going to dig a hole in my garden and bury him in it. loved it. such wonderful truth in God's hands. praise God for His faithfulness!